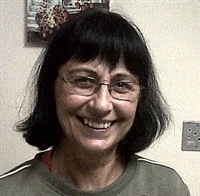 Marina Da Conceicao has won Free Accommodation 1 time! "Over the moon! A wonderful belated 60th birthday present after a just as wonderful (but MUCH too short) stay at Oban Guest Farm! Now that can be rectified, just got a little bit of extra cash :)"
15 Free Accommodation Winners so far! As your hosts at Oban I would like to take the time to give you a little background into how we came to be heading up this amazing Olde world farm that has been going since the beginning of the century and been functioning as a guest farm for well on 80 years, despite three devastating fires over its lifetime that have just made the previous owners all the more determined to restore it back again. May I take a few minutes to share our story and how this journey began? Scroll back to the year 2000 when my hubby and I were actively pastoring a church and were invited by friends to come and look at a place for purposes of ministry, to form a retreat, a place where harried city folk could draw aside and recharge those worn batteries. Here the journey begins: Upon entering the gates I exclaimed to my hubby that I thought he had lost it as this property had stood unused for 8 years and that at our age there was no way we could pick up this mammoth task, needless to say by the time we had left the conversation had changed. There was such a sense of peace and tranquility that flooded us (despite it being the middle of winter and quite barren)that we believed we had found that wonderful fulfillment of a dream hidden deep in ones heart, It took two years before the dream became a reality and Oban was ours. Much has happened over the past 14 years we have been here, many trials, joys, aching bones and above all a sense of accomplishment as we see new goals that have been kindled becoming a reality every year that passes,it has been a long, slow journey but one that has taught us so much and has tested us to the limit yet always the sense of destiny has prevailed. The beauty that surrounds us and the timeless peace and tranquility embrace a person and it is our desire that as you our valued guests come be part of “Our family” that our motto for Oban “A place of refuge where time stands still and friends meet” will become a reality to you. Here we strive to maintain an Olde Worde charm yet have the modern conveniences that will make you stay a memorable one. So whether you are just overnighting with us or staying a few days our hope is that you will be refreshed after your journey, come and turn back the clock 40 years and experience some Olde World hospitality. Your hosts. 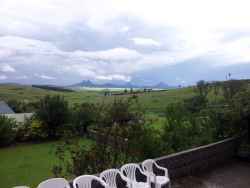 Keir and Kim We offer: "Farm Style Accommodation" on the northern slopes of the Escarpment, halfway between Johannesburg and Durban some 5 Kms out of Van Reenen on the De Beer's Pass Road. The Wilge River flows less than 1 km away from the farmhouse. Our accommodation is rustic, farm style, ungraded.The only stars you will see here reflect majestically in the Heavens at night. Clean comfortable rooms with excellent views of the Tandjiesberg Range.We have the Olde Homestead in the centre with the rooms set in gardens around it, the Olde homestead houses the lounge, pool room, dining room, kiddies play room as well as a small shoppe where soft drinks, sweets and gifts can be bought. The rooms do not have televisions in them as here we love our guests to share together and enjoy a time of rest from the frenetic pace of the city. Take time to play one of the board games ,enjoy outdoor walks or mountain bike rides (got to bring yours with) , the farm animals and dogs are much loved by the guests. Ruthie the Alsation cross is every childs partner for the duration of the stay. Harrismith is half an hour away,here you can shop in our modest yet lovely town. Fishing is excellent at the Sterkfontein dam +- 50 Kms from us and within 15 Km's is a Trout Farm. We have a small dam on the property with Bass in it. We comfortably host weddings for 5 to 50 guests , let us make your day a special one, need to host a small conference or camp , well look no further , we are here to help you. Things are slower here. To fill your bath takes ten minutes from our natural spring water through our gas fired geysers. The water is crystal clear and is drinkable from the tap. All our meals are served in the main family dining room. It is hoped that our “home cooked” hearty Farm meals will whet your appetite, here we have a set menu every evening if a dinner is required . Our Farmstyle breakfasts consist of Fruit salad / Yoghurt, cereals or porridge followed with either an English breakfast or one of our famous omelets , alternately try our Pancake Stack , toasts and homemade preserves together with either tea or coffee if desired round out the meal. As we are not licensed guests are welcome to bring their own alcohol and make use of the 3metre fridge in the bar area of the Olde Homestead. Our main lounge is made for comfort ,peace and tranquility, it has a stunning view of the Tandjiesberg Mountain range and in winter we have a Jet master that warms the cockles of your heart. Oban has over 240 recorded bird varieties sighted on the property and in the adjacent area. The farm is excellent for bird watching as it is quiet and peaceful. You will awake every morning to the sound of the Bokmakierie.It's an artist's paradise. Come set your feet up, enjoy good hospitality, great farm style food and allow the serene atmosphere to wash away the hustle and bustle of city living.Here you can turn your watches back 40 years and find a place where friends meet and time stands still.